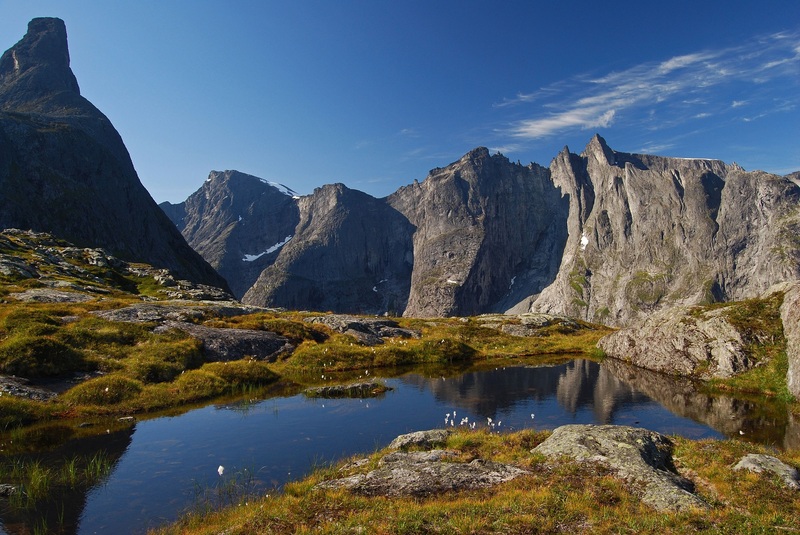 The walk over Besseggen is one of the most popular mountain hikes in Norway. About 30,000 people walk this trip each year. The route over Besseggen starts at Gjendesheim, up to the trails highest point, Veslfjellet (1,743 m), down Besseggen, further over the relatively flat area Bandet (at the foot of Besshø), and ends at Memurubu, where one may take the regularly scheduled ferry route back to Gjendesheim. Many choose to do the hike in the other direction by starting at Memurubu after first taking the ferry there from Gjendesheim. The trip is estimated to take about 5–7 hours to walk without rest stops. From Besseggen there is a great view over Gjende and Bessvatnet. One of the unique aspects of the view is that Gjende lies almost 400 m lower than Bessvatnet, and while Bessvatnet has a blue color typical of other lakes, Gjende has a distinct green color. The green color is the result from glacier runoff containing clay (rock flour). Looking down towards Memurubu one can see the nearby river Muru coloring the water with a light colored runoff. Eikesdalsvatnet is a lake in Nesset Municipality in Møre og Romsdal county, Norway. 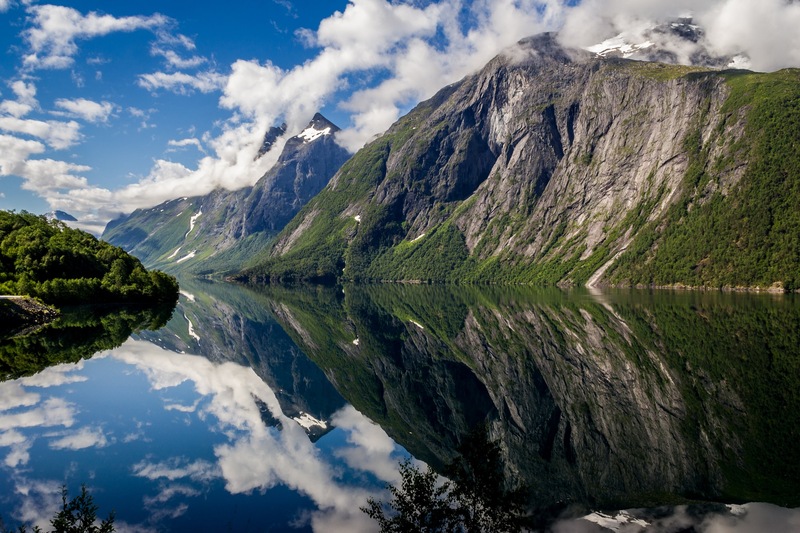 The lake is long and narrow, roughly 18 kilometres (11 mi) in length, and it is the largest lake in Møre og Romsdal county. The village of Eikesdalen is located at the southern end of the lake. Its main inflows are the river Aura, flowing northwest from the lake Aursjøen, and the river Mardøla with the famous waterfall Mardalsfossen. The lake flows out through the River Eira which flows into the Eresfjorden. The lake is surrounded by 1,500-to-1,800-metre (4,900 to 5,900 ft) tall mountains like Juratinden and Fløtatinden. Moskenesøya (lit. 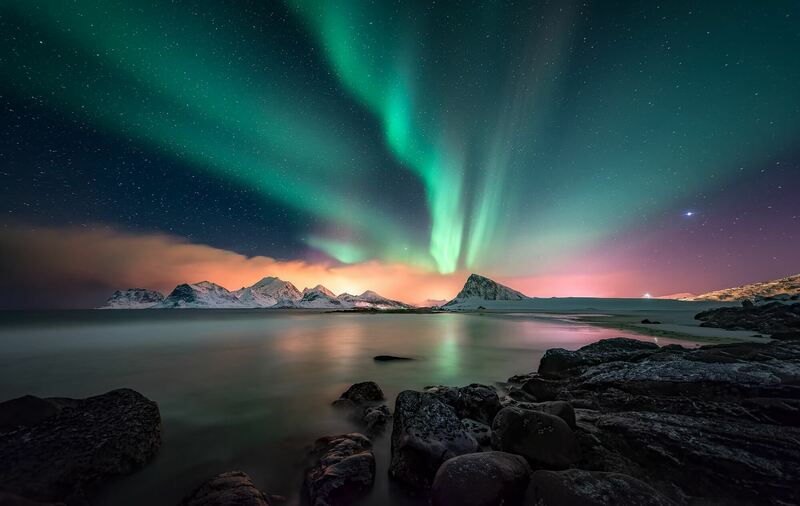 Moskenes Island) is an island at the southern end of the Lofoten archipelago in Nordland county, Norway. 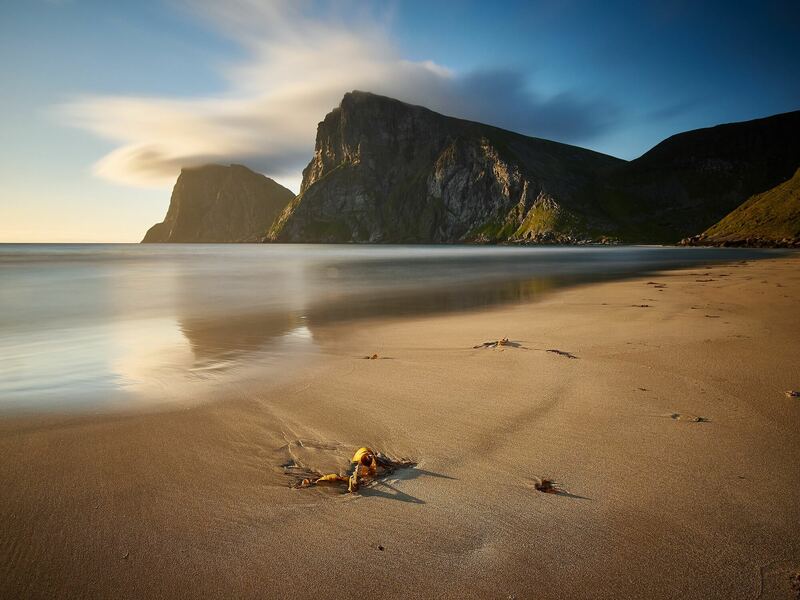 The 186-square-kilometre (72 sq mi) island is located in the municipalities of Moskenes and Flakstad. 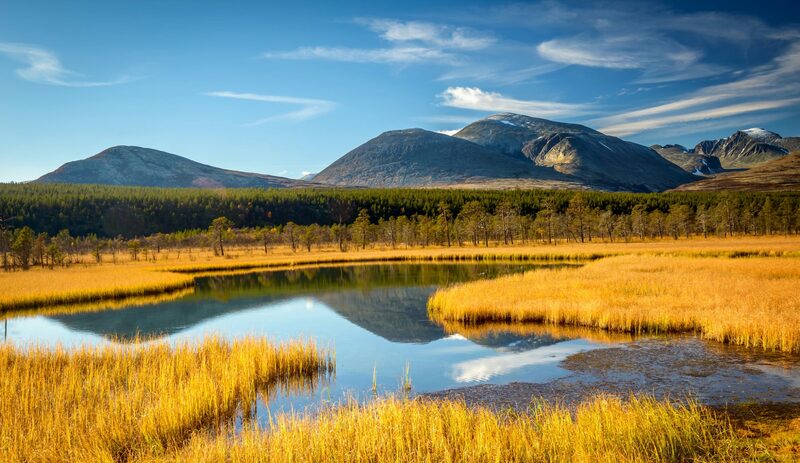 The island consists of an agglomeration of glaciated hills with the highest peak being the 1,029-metre (3,376 ft) tall Hermannsdalstinden mountain. It is elongated from southwest to northeast and it is about 40 kilometres (25 mi) long and 10 kilometres (6.2 mi) wide. It also has a very uneven shoreline. The island is connected to the nearby island of Flakstadøya by the Kåkern Bridge which is part of the European route E10 which ends on the Moskenesøya island at the village of Å. There are many villages on the island. Flakstad municipality, on the northern part of the island, has several small villages including Fredvang, Selfjord, and Krystad. Moskenes municipality, on the southern part of the island, has the villages of Å, Hamnøy, Moskenes, Reine, Sakrisøy, Sørvågen, and Tind, all located on the eastern side of the island. There were settlements on the western coast, but the last ones were abandoned in 1950s owing to severe storms. "There is evidence of human settlement extending back at least 11,000 yrs in Lofoten, and the earliest archaeological sites ... are only about 5,500 yrs old, at the transition from the early to late Stone Age." Iron Age agriculture, livestock, and significant human habitation can be traced back to ~250 BCE. The Nærøyfjord (or Nærøyfjorden) is a fjord in the municipality of Aurland in Sogn og Fjordane, Norway. 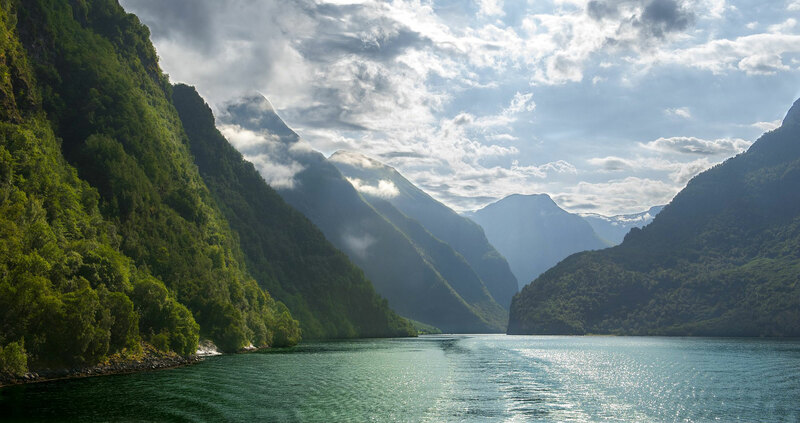 The narrow fjord is a branch of the large Sognefjord, and it is featured on the "Norway in a Nutshell" daytrips for tourists. 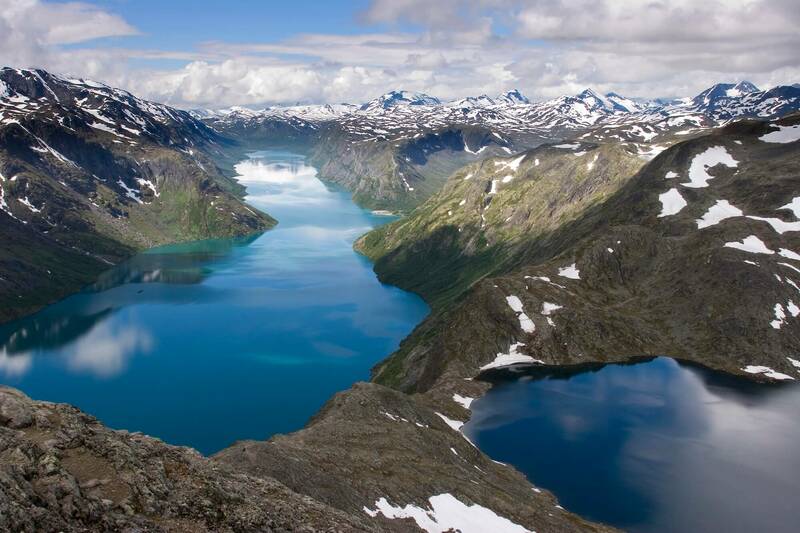 The 18-kilometre (11 mi) long fjord is only 500 metres (1,600 ft) wide in some parts. The river Nærøydalselvi flows down the valley Nærøydalen into the fjord at the village of Gudvangen, near the highway E16. The village of Bakka and the Bakka church are located on the west shore of the fjord. Since 2005, the Nærøyfjord has been listed as a UNESCO World Heritage Site. It has also been rated by the National Geographic Society as the world's number one natural heritage site along with the Geirangerfjord. The Seven Sisters (Norwegian: De Syv Søstrene or Dei Sju Systrene, also known as Knivsflåfossen) is the 39th tallest waterfall in Norway. The waterfall consists of seven separate streams, and the tallest of the seven has a free fall that measures 250 metres (820 ft). The waterfall is located along the Geirangerfjorden in Stranda Municipality in Møre og Romsdal county, Norway. The waterfall is located just south of the historic Knivsflå farm, across the fjord from the old Skageflå farm. 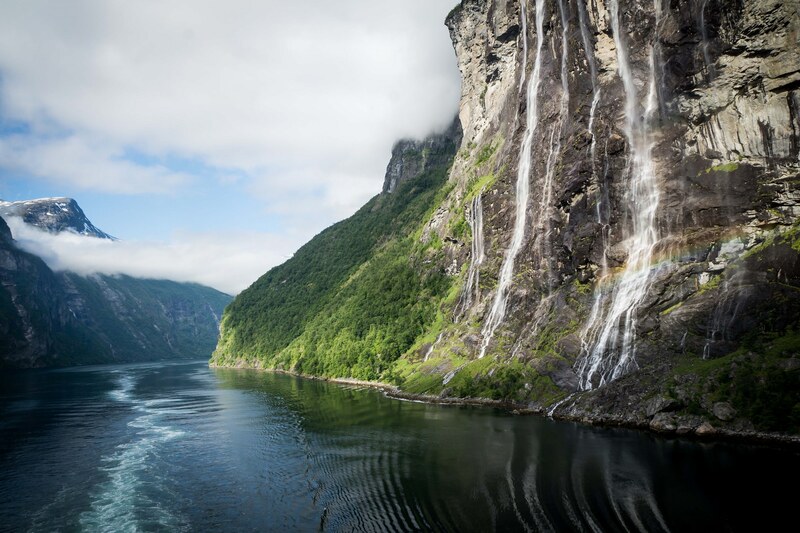 The falls are about 6.5 kilometres (4.0 mi) west of the village of Geiranger. It is part of the Geiranger World Heritage Site. "The Seven Sisters" (Norwegian: De Syv Søstrene or Dei Sju Systrene) is located on the northern side of the Geirangerfjorden, and directly across the fjord lies a single waterfall called "The Suitor" (Norwegian: Friaren). The legend of the seven sisters is that they dance playfully down the mountain. Meanwhile, across the fjord, the suitor (or courter) flirts playfully with them from afar.